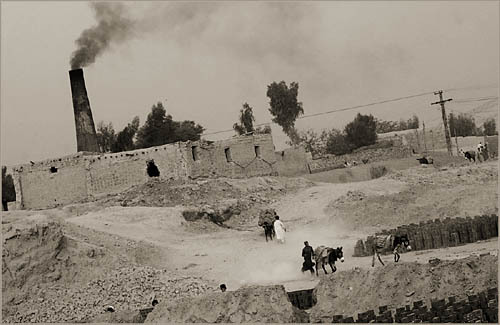 Afghan refugees haul bricks on donkeys while smoke pours from a brick kiln at a brick factory in Peshawar, Pakistan near the border of Afghanistan. Millions of Afghan refugees live in Pakistan, most of them poor and living in refugee camps and working hard labor. All photos are for viewing purposes only. Any reproduction is prohibited. Copyright 2003. All rights reserved. Site designed and hosted by Desktop Consultants, LLC.